For almost a decade, Ostend Airport was a major cargo center, handling everything from emergency relief flights to daily trips bringing in car parts for a nearby Volvo factory. The aircraft involved were mainly former Soviet transports or elderly 707 and DC8 freighters, making this previously little known airport one of the most interesting around. 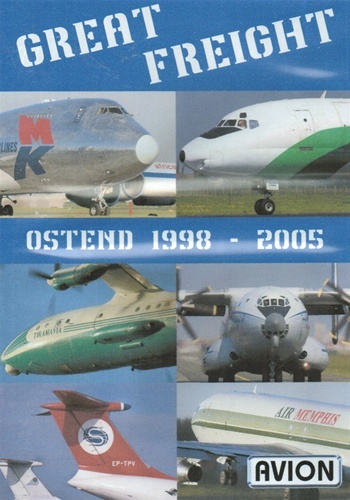 Filmed on digital video, this DVD is a testament to the skills and patience of cameraman Patrick Vereecke, who spent hours there, capturing such exotica as a HeavyLift Belfast, FIA CL44 Guppy and ADB AN22, as well as Air Atlantique DC6 bump-starting one of its engines. Being right on the Belgian coast, Ostend gets its fair share of stormy weather and we have an amazing series of contact between AN12s and Belgium, where it's difficult to decide who is the most rugged! For what has to be the most heart-stopping crosswind landing ever, the 85 degree angle of Hydro Air's 747 to the runway is hard to beat. A little further round and it would have landed backwards! Those are some of the highlights. What about the daily routine at Ostend? There isn't many. MKs natural metal 747 might be followed by a Libyan Cargo AN124. Air Memphis' unique hush-kitted 707 mingles with AN12s, IL76, the occasional CV580 and a clutch of DC8s. It was a wonderful era, now gone, but fortunately captured on this great DVD. In NTSC DVD format with runtime of about 75 minutes and region-free.